Recorded at Tau Recording Studio, Acireale, 19-21/3/2007. Remember the good old days when your choice of recordings was limited? Remember when you could claim familiarity with every recording of these pieces? Those days may be gone forever, but I dare anyone to forget these performances once heard.To begin with, the warm and enveloping sound of the Steinway D is magnificently caught by producer and sound engineer Andrea Alia; and the notes by Charles Rosen, taken from his book The Romantic Generation, are all one could wish for. The young Italian pianist has won a host of competitions and has played with orchestras and ensembles worldwide. Her studies with Maria Tipo, LeonFleisher, and Fou Ts'ong helped hone her skills to a remarkable degree. Ballade 1 is all poetry here. The luscious melodies and emotional passions are playedwith juicy abandon. The final coda tears away with a ferocity rarely encountered. Ballades 2-4 are played in a heart-on-sleeve manner instead of showing the usual aristocratic reserve. The intensity of the stormy middlesection of Ballade 2 is startling. The Fantasy is a colorful adventure in sound. Even the often performed Barcarolle becomes a more monumental structure in Ammara's hands. [...] This is indispensable among the many, many Chopin recitals. As time progresses and more recordings appear of standard repertoire that dozens of other artists have covered, the question arises: are you happier with new releases that explore new ways of playing old music, or with new artists who play old music in the style of master musicians now dead and gone? Such is the dilemma, for me, with this new release of the Chopin ballades, Fantaisie, Barcarolle, and the op. 30 Mazurkas. Alessandra Ammara, 36 years old, is hereby thrust into direct competition with some of the greatest Chopin masters of the last century, particularly Alfred Cortot, Walter Gieseking, Artur Rubinstein, and Shura Cherkassky. That she emerges not only unscathed but in a favorable light is no mean achievement; these earlier pianists were among the greatest artists of all time. That she doesn’t shed new light on these works is not surprising. Despite some individual touches of rubato, her phrasing is their phrasing. She plays deep in the keys, she has a wonderfully warm, rich tone, her phrasing is highly musical, and in the end one comes away with a very satisfying feeling of her ability to play this repertoire. In short, she doesn’t supplant Cortot, Rubinstein, et al., but she complements them very well indeed. Thus I view this CD more in the nature of a promotional flyer for Ammara, a sample of what you’ll hear if you go to one of her concerts. All well and good. She still has a way yet to grow as an artist insofar as finding her own unique voice and building drama, but she’s certainly on the right path. In essence, if you already have a recording of the ballades by Cortot or Rubinstein, or the Barcarolle by Gieseking (my favorite) or Cherkassky, or the Fantaisie by your favorite Chopin pianist, you will not necessarily need this record. But if you’re curious to hear a contemporary pianist play this music in their tradition, this is a splendid ticket-seller. 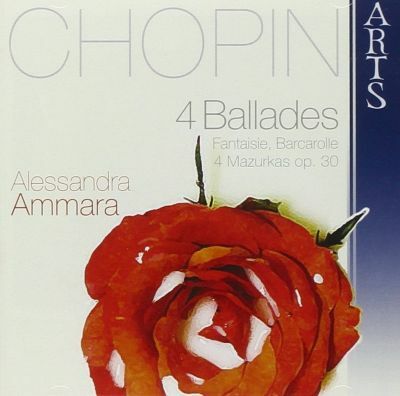 I would most certainly attend an Ammara concert of Chopin based on the recommendation of this disc. The sound quality is uncommonly good; even the quietest passages sounded lifelike without being over-resonant. Judging by their Web site (www.arsaures.com), this seems to be the start of a new CD line for Ars Aures, a highly respected Italian loudspeaker company. They’ve chosen well.